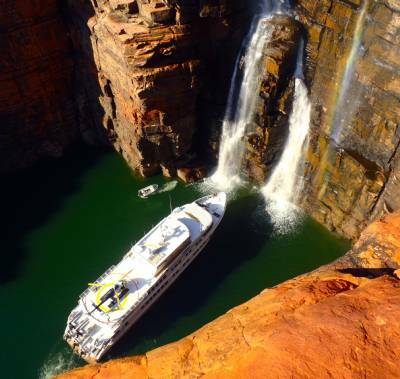 “North Star pioneered luxury adventure-cruising in the Kimberley 25 years ago. No one knows the Kimberley like we do – we live there, it’s our backyard. And the True North is purpose built for what we do – bigger ships cannot go where we go. Our repertoire is also unchallenged. We carry six dedicated expedition Luxury Boats– fully surveyed 20 foot runabouts – our guests are primarily concerned with comfort and safety and rubber boats just don’t cut the mustard! Of course the fulltime helicopter adds another dimension to everything we do and, an all-Australian crew uniquely chaperones every activity. With just 36 guests on-board it’s always a relaxed small group feel with plenty of opportunity for personal service and attention to detail. Our guests pretty much get to do what they want, when they want and it’s no wonder they consistently remark “that’s the best holiday I have ever had”. Thanks to Cruise Passenger Magazine and all our supporters!